One of the most exciting things about writing a food blog is that people from all around the world stop by to try my recipes. When catering for a worldwide audience it can sometimes be difficult to know how to pitch a recipe or even what to call it. Should I refer to aubergines as eggplants? Ice lollies or popsicles? English muffins are made from a dough which is rolled, cut, and then cooked on the hob (stove) before being finished off in the oven. They are light and fluffy in texture and have a crispy outer crust. Usually they are cut in half before being slathered in butter and often topped with a poached egg and hollandaise sauce. They are delicious! Although crumpets are also cooked on the hob they are actually made with a yeast based batter which is poured into circular rings in a piping hot pan. Bubbles appear on their surface making them almost sponge like. They are much more chewy in texture than an English muffin and are perfect for soaking up butter, honey and any other topping you desire. What do they have in common with English muffins? They are also delicious! But that’s probably where the similarities end. As with most traditional English foodstuffs crumpets are old. Supposedly recipes for crumpets go back as far as the 1300’s though they were probably around long before that! Crumpet is also used as British slang for a particularly sexually attractive woman. In Australian slang it is part of the expression: “not worth a crumpet”, meaning that somebody or something is useless. To say that crumpet is British slang is probably a bit of an overstatement and I don’t think most people would have a clue these days if you called them a crumpet! It’s actually cockney rhyming slang (crumpet = strumpet) so if you fancy trying out this new lingo you’re probably best saving it for the older generations in East London! But enough about crumpet slang. Why have I taken the time to cook and share this ancient recipe when Warburtons make tasty ones I can just whack in the toaster? Well I wanted to show you just how easy it is to make fresh crumpets at home. Most people will only ever have had store bought crumpets but I think that it’s important we know how to make simple staple foods like crumpets! Quite simply they are cheap to make and delicious so why opt for convenience when you could have a much tastier product for no extra cost? To make a batch of crumpets at home you’ll just need flour, milk and yeast. You can make them in big batches and freeze them until you want to serve them. Just toast them until they are warmed through. It couldn’t be simpler than that! What you spread on your crumpet is really a matter for you and you alone. I am a bit of a purist and only ever go for butter and a bit of salt. That’s right, crumpets are neither sweet nor savoury so you can top them with ANYTHING you want. I even had an amazing crumpet stacked high with slow cooked short rib, poached egg and hollandaise the other day it was epic! Emily from A Mummy Too has lots of crumpet recipes but I love her meze inspired crumpets! Elizabeth from Elizabeth’s Kitchen Diary has come up with the epicly named “Hipster Cowboy” crumpet. 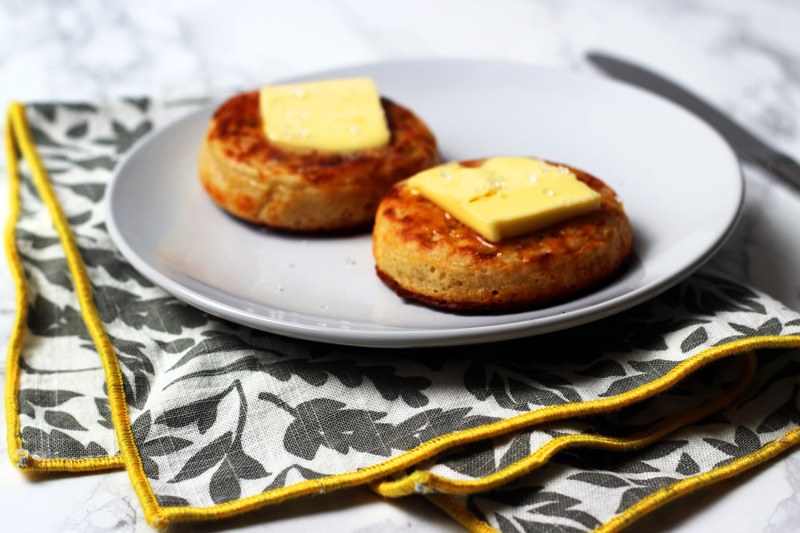 But before you start getting too carried away planning what you want to top your fresh crumpets with you’re going to need to actually make them. Print out the recipe below and get yourself to the kitchen! Put the flour, yeast and sugar in a bowl and stir in the milk slowly until you have a smooth batter (a bit like a pancake batter). Cover the bowl and leave in a warm place to rise for 1hr-1hr 30 mins or until doubled in size and bubbly. Add the salt (and a little more milk if the batter is very thick) and stir. Lightly oil the insides of 4 x 9cm metal crumpet rings or metal cooks’ rings (sometimes called egg rings). Put the rings into a large non-stick frying pan and place over a low-medium heat, add a little oil in the middle of each ring. Spoon the batter into the rings until they are roughly half full. Let the crumpets cook slowly for about 10-15 mins or until the bubbles have popped, the tops have set and the crumpets are pulling away from the sides of the rings. Carefully take the rings out of the pan and transfer the crumpets to a baking sheet and place under the grill (See note 1). In the meantime, repeat the process above with the remaining batter. Once the crumpets have been toasted under the grill serve with your favourite toppings! 1. 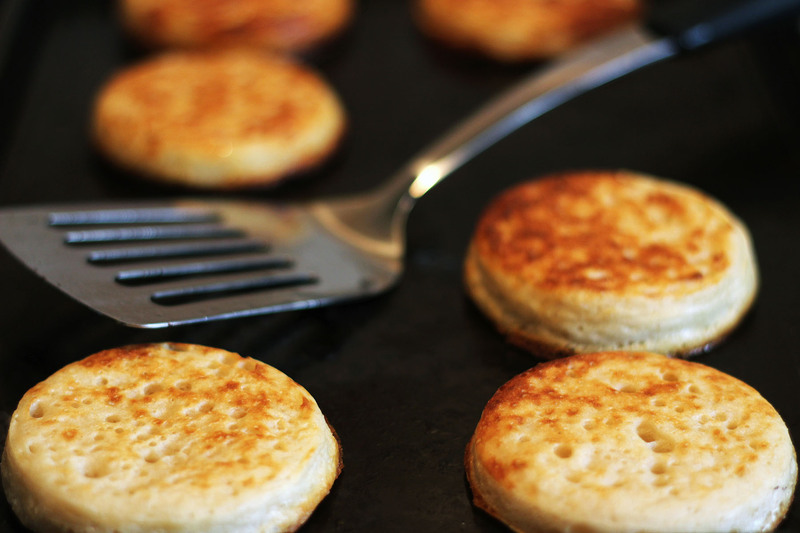 If you want to freeze your crumpets, remove them from the frying pan and allow them to cool completely. They can then be placed in a freezer bag and toasted at a later date. You won’t believe it, but I was actually looking for a proper recipe to make my own crumpets for the first time. Looks like I found it and I cant wait to make them! These crumpets look yummy! I like to top mine with homemade Nutella, so yum! But I like the idea of using them in a savoury recipe. Will have to give these a go. Oooooh I bet homemade crumpets are so much nicer! These look so good. I need to try making them. 🙂 Also, I love all the crumpet info. Definitely do Kate. I was a bit dubious the first time but now won’t look back! I’ve never made crumpets at home but you make it sound so easy. I know they would be super versatile and could be used in so many ways all week! I promise you they are as easy as they look! I’ve not had a bad batch yet! I am not showing this to my husband. He LOVES crumpets. His grandparents were from England. He would have me making these all the time!! Show your husband the recipe and get HIM to make them Gloria! Win-win 😀 Happy International Women’s Day! I loved reading this post! I always knew they were different, but hadn’t done much research on the topic of crumpets v. english muffins. Now I’m ready to make my own crumpets! I love these little crumpets! Beautiful! I gotta admit, I used to think crumpets were almost the same as English muffins – I didn’t realize they began as a yeasted batter and not a dough – almost like yeasted pancakes? Thanks so much for helping me learn something new today! I love me some buttered crumpets! also love putting on some cheese slices and popping them in the microwave for a few seconds 🙂 These homemade ones look so delicious! Mmmmmm yes! Melty cheese! Can’t beat it!